There really is nothing quite like comfort food, especially when it's a hearty homemade dish to satisfy your cravings. Colman's Tangy Mustard-Crusted Steak Fries are easy-to-make and taste great! A great twist on a traditional classic that every member in your family will enjoy. You can find oodles of different recipes when you visit the Colman's site online! Preheat the oven to 425°F. Halve the potatoes and cut each half lengthwise into 4 wedges. Spray a roasting pan with nonstick spray. Toss together the potatoes, shallots, oil, Colman's Original Prepared Mustard, cumin, and salt in a large bowl. Spread the potato mixture in a single layer into the roasting pan, placing potatoes cut side down. 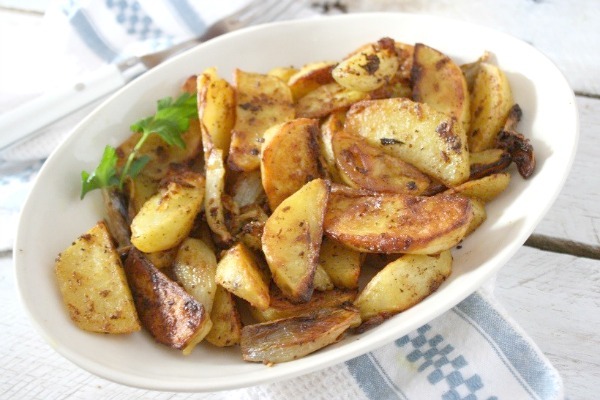 Roast until the bottoms of the potatoes are crisp and golden, 15 – 20 minutes. Turn the potatoes with a metal spatula and roast until tender and crisp on the other side, 10 – 15 minutes longer. These steak fries look delicious. We love potatoes and I shall have to try this recipe soon.